Being a journalist sometimes means being a historian – Pamela Wood. Anne Arundel County’s first county executive, Joseph W. Alton Jr., died on Friday morning. I helped my colleague Allison Bourg by combing through decades’ worth of old newspaper clippings about his life. I’m always happy to help when I can on breaking and important news, even if it’s off my beat. But I really do enjoy reading old stories. First, when someone dies, old stories are the only way to get their voice in the story. As a reader, I find it interesting to be reminded of some of the things the deceased person said. And the old quotes help to fill out the deceased person’s character a bit. Plus, I just love journalism in all forms, especially from years ago. Because Alton was county executive, a state senator and a sheriff at various points, my newspaper had tons of clippings. And the ones I found on Friday didn’t even cover Alton’s full career. 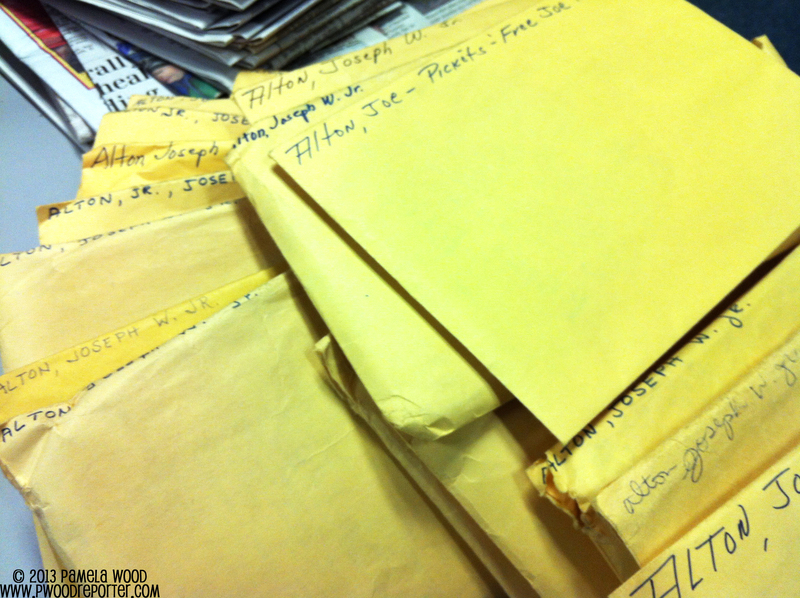 Envelopes full of newspaper clippings about Anne Arundel’s first county executive, Joseph W. Alton Jr. I was surprised to find that there seemed to be bias creeping through many of the stories. It seems the reporters and editors mostly seemed to like Alton. Some of the wording and descriptions certainly wouldn’t fly in today’s press, where we do our best to play stories straight and keep any personal feelings out of the news stories. I also was intrigued by the deadlines. The Capital was — and still is — an evening newspaper. Nowadays, the final deadline for the evening print edition is about 9:30 a.m. It used to be later — maybe 10:30 — when the paper was still printed in the same building. But back then, the deadlines must have been much later. When Alton was sentenced in federal court in Baltimore (he had pleaded guilty to soliciting contributions from companies that wanted work with the county government), the sentence came down at 10:35 a.m. And that evening’s paper included the full story, photos and a sketch of Alton in the courtroom. The writer might have been able to call in his story from a pay phone, but the photographer and artist surely had to drive back to Annapolis. 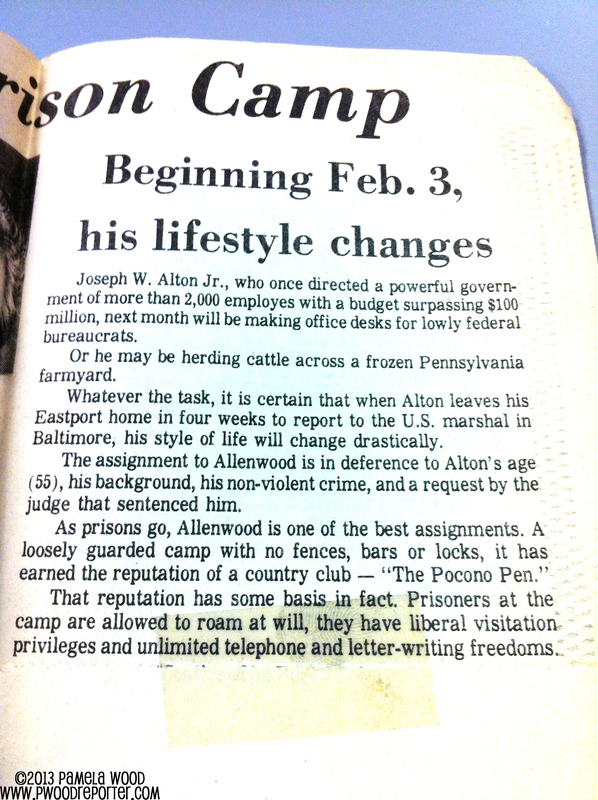 One of many newspaper clippings about Anne Arundel’s first county executive, Joe Alton. This is when he was sentenced after pleading guilty in federal court to soliciting kickbacks from firms seeking contracts with the county. He ended up serving about seven months. Most interesting of all, however, was a story about what prison life would be like for the county executive. I had to do a double-take when I saw that story, because I wrote essentially the same story last month, when John R. Leopold, Anne Arundel’s most recent former executive, was sentenced to 30 days behind bars on misconduct charges. 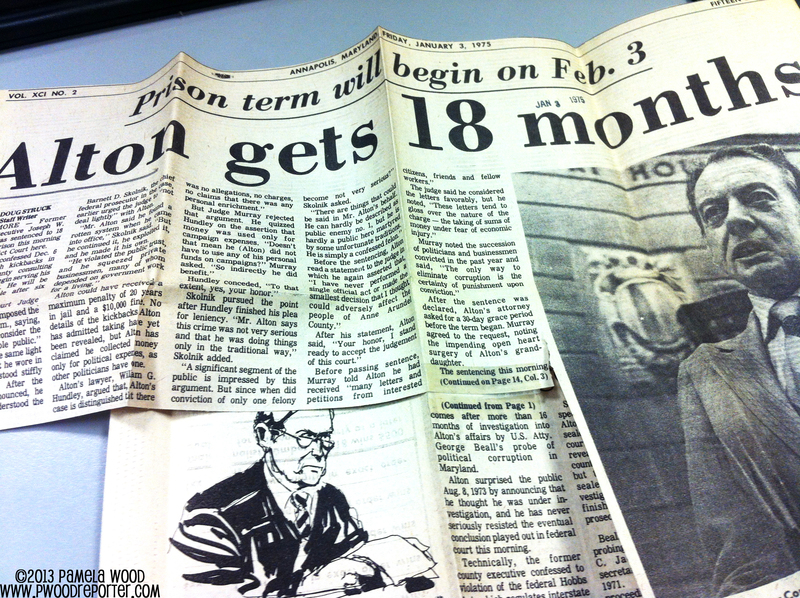 A 1974 story describing what a former county executive’s life will be like behind bars. I wrote a similar story in 2013. I think most of the historical Capital articles are available on microfiche at the Annapolis Branch of the library, no? As Joe Alton’s granddaughter I find this article fascinating. Thank you so much for sharing this. I love the photograph of the Alton files. I can only imagine what is inside.